Have you ever woken up at night thinking you heard a strange sound? What if that sound was someone turning the handle on your front door. What if the the next sound you heard was a loud thud of the door being kicked in? Amy and Emily welcome to the show registered nurse and firearms advocate, April Nicol. Join the girls as April shares her story about experiencing a break-in and how having a gun present helped prevent a potentially violent crime. The girls talk about the importance of proper training, how to get comfortable with a firearm, and, of course, get back to basics with their favorite beauty and skin care tips. April does it all from shooting, to working out, to being a mom, and she shares those passions on her Instagram page. This episode really captures what it is to be a Not Your Average Gun Girl. Imagine you’re walking to meet your friends for a night out but instead a stranger abducts you at gun point and your life flashes before your eyes. What’s your plan? Do you have a fighting mentality and the will to survive? Amy and Emily welcome Emmi Rose to this week’s eye opening show. Join the girls as Emmi shares her story of surviving a random violent crime. 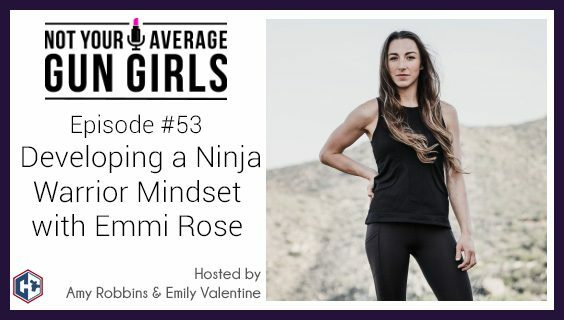 Hear about how she survived by having a strong mindset, staying focused, and having a plan. Now in a career as a law enforcement officer, Emmi is doing her part to keep our communities safe. In her free time she also is spreading her message of female empowerment, teaching other women to shoot, and training for her third season competing on American Ninja Warrior (ANW). The girls talk about the preparation required for ANW and how anyone with a goal can overcome negativity. Emmi also shares her favorite off duty carry gun and a holster she will literally do a back-flip over. In this week’s episode, Amy and Emily talk with competitive shooter, mother, entrepreneur, and female gun sports advocate, Diana Hufstedler. Hear about Diana’s background of coming to the US, pursuing an interest in firearms, and balancing it with work and family. After getting laid-off, Diana decided to start her own content marketing company, Gun Queen. The girls talk about Diana’s journey to starting her company, getting more involved with shooting, and building a strong community of women in the firearms industry. From starting her own company to winning state, regional and national competitions, Diana is proving that hard work pays off! In this week’s episode, Amy and Emily are joined by University of North Texas student and sorority member, Sydney Sheridan. Hear about Amy’s first hand experience speaking to the sorority chapter on self-reliance and the reaction she received. Listen to how Sydney is being vocal on women’s rights to defend themselves, the push-back she is getting from the student body and being labeled as ‘the crazy gun girl’. The girls discuss why students seem to be afraid of the basics of safety and why they don’t want to discuss situational awareness. 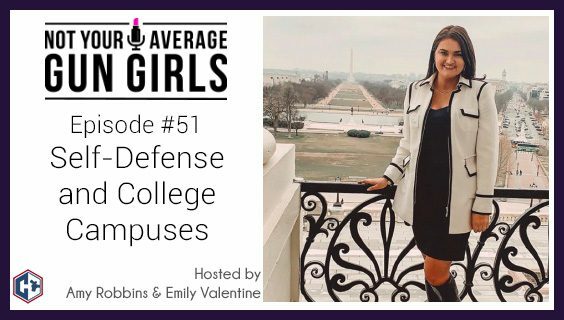 If you have a daughter attending a college or are interested in hearing more about the political climate on our universities then you don’t want to miss this episode. In this week’s episode, Amy and Emily talk about a listener, Lauren that wrote in to the show about her personal journey to firearms and self-reliance. The girls were so moved by her story that they invited her on to share it with all of you. You’ll hear about how Lauren was home during an attempted day time burglary of her house which has led her down a path of firearm ownership and concealed carry. The girls also talk about the importance of having a plan, getting the proper training, and introducing firearms to your family. In this week’s episode, Amy and Emily discuss an abduction in Boston that left a young woman missing and later found murdered. While the media will tell the tragic story, they rarely provide solutions for women’s self-defense. The girls talk about preparedness and starting the conversation with yourself as well as with someone you know that might be new to a self-reliant lifestyle. The girls also discuss less lethal defense tools and the importance of making training a priority. In this week’s episode, Amy and Emily talk with firearms instructor and national magazine contributor, Karen Hunter. Listen in to hear Karen’s story of how she got into shooting which led her to become a leading firearms reviewer. Like many new shooters she needed to overcome her fears of the firearm and become confident while carrying. The girls also talk about the process of being introduced to the firearm and how your mindset changes to embrace a lifestyle of self-defense. 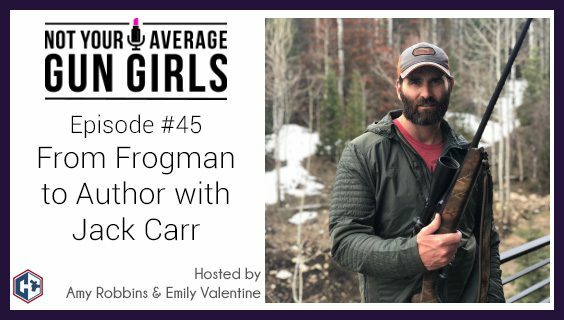 In today’s episode, Amy and Emily are joined by veteran and author, Jack Carr at the SIG Sauer booth during SHOT Show 2019. Jack spent over 20 years in Naval Special Warfare and when he transitioned to civilian life he began his second career as a fictional author. Listen in to get a behind the scenes look at how Jack comes up with his ideas, the real-life gear his characters use, and how Johnny Cash influenced the Terminal List. Finally, Jack lets us in on the future of the franchise, his nontraditional approach to getting his book published, and how he is using social media for the first time.